“RUSSIA REJECTS PLAN FOR SOLVING BERLIN CRISIS,” read the Florence Morning News front page headline Sunday, October 24, 1948. It took me several years to find this story — not the one about Russia and Berlin; the one about the fire. I remember that night clearly, the sight, the sounds, the smells. And the people. It was well past my bedtime when the alarm went off that night. Half of downtown Florence must have heard it. My parents hurriedly got us up and dressed and the next thing I remember, we were headed down the street toward the railroad tracks. 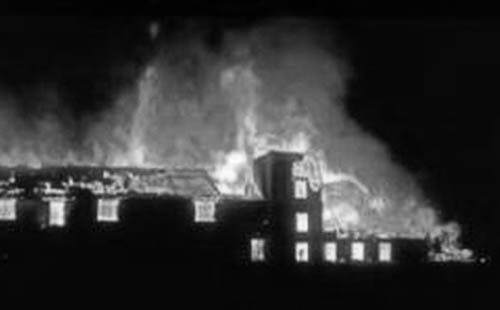 “The fire attracted a large crowd of people from all sections of the city,” read the newspaper article. Despite the late hour hundreds of people crowded the streets, all of us drawn to see what was going on. There wasn’t just a foot-traffic jam, there was a car-traffic jam too, as more and more people drove in and parked haphazardly along the streets. Some men simply left their cars or trucks in the middle of the street, jumping out and running toward the fire. Looking back, I realize they were hurrying to help the overwhelmed fire department. From the horrible glow against the night sky we knew it had to be bad, and it was. As we got near, water hoses criss-crossed the street and we had to watch our step. Mama and Daddy each held one of us kids in a tight grip while we walked with the growing crowd of other parents and children. When we had gotten as close as we were permitted by police and firemen, the crowd spread out and stood assembled to watch and to pray. Now and then through gaps in buildings we’d see flames shooting into the air, but mostly we just saw a dark red glare extending upward and outward. Clouds of smoke could be seen rising in the night sky, illuminated by the glare. People shuffled around, jockeying for position and inching forward. “Can’t see much,” one man said, turning back to give his spot to someone else. On Sunday afternoon our family joined others at the scene of the fire. Nothing much was left but pile after pile of blackened rubble. Several fire hoses were still in place, I guess in case of a flare-up. I don’t know how there could have been one, considering the thousands of gallons of water poured onto the fire. We had to step around black puddles of run-off on sidewalks, ground and street as we walked closer. The smell wasn’t as much of a stench now, it was more like the stink from garbage piles burning down at the city dump. That fire was a huge loss to the City of Florence. The cotton platform was the only one of its kind in town, according to the ACL spokesman, and I have no idea if it was ever re-built. Why did I search for this news article for several years? Other major fires had happened in town before and several more after that, but this one imprinted itself in my memory. I could remember how old I was at the time. I could still feel the coolness of the night air on my face, so I knew it had to be fall or spring. I could still see the glare of the flames in my mind, hear the fire engines and smell that horrible odor. I could still hear the word “warehouse” passed from person to person as we walked along. But I didn’t know exactly what had happened and it bugged me. So I’m glad to finally learn what did happen that night, but sorry too. My mother’s house burned in 1965, also in the middle of the night. I’m not ready to write about those memories yet. A fire is a dreadful thing, whether it’s a business or a house, no matter what the year. Fire caused an estimated damage of $80,000 or more here last night when the Atlantic Coast Line Railroad Co. cotton platform warehouse containing some 100 bales of cotton, and an adjoining building containing a boxcar of roofing and another warehouse full of furniture was destroyed. The cotton platform itself, about 200 by 30 feet in dimensions, was said to be almost a total loss. It was owned by the A. C. L. and was used by cotton buyers of this section for weighing and shipping cotton daily. It was located between North Irby and Lucas Streets at the A. C. L. freight tracks. Frank Key of Florence estimated that he lost some of the roofing, the most of which had just been delivered, he said. Mr. Key rented space in the south end of the platform building from the A. C. L.
An adjoining building, said to be owned by Marion Lucas of Florence and rented to the Weaver Furniture Company of this city was also destroyed by the fire. The company was said to have had the building stored full of furniture but no representative of the company could be contacted last night for comment. R. B. Hare, superintendent of the Columbia District, A. C. L. said that the platform was built about 8 or 10 years ago. Mr. Hare was at the scene of the fire but he did not estimate the damage to the building. He said that it is the only cotton platform of its kind in Florence. M. J. Dickert, A. C. L. freight agent, also at the fire, said that cotton was handled on the platform daily and he estimated that about 100 bales were destroyed by the fire. The fire attracted a large crowd of people from all sections of the city. At the height of the fire a drum containing tar or oil exploded and was heard all over the city. Firemen focused their hoses on the section with the drums and no others exploded. This entry was posted in 1940s, Childhood memories, Downtown Florence and tagged 1948 cotton warehouse fire. Bookmark the permalink.